To evaluate the efficacy of the Novaerus NV1050 system against aerosolized Aspergillus niger spores. 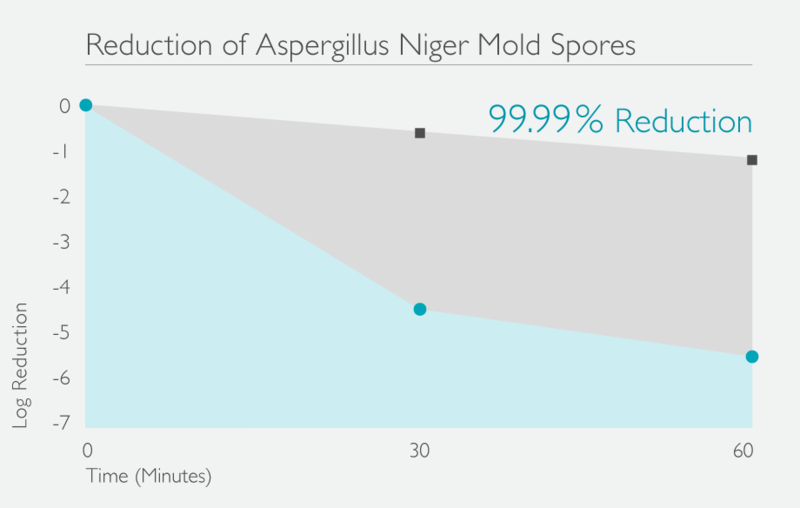 A. niger spores were aerosolized into the sealed bioaerosol chamber using a dry powder disseminator. AGI impingers were used to capture chamber bioaerosol concentrations. All impinger samples were serially diluted, plated and enumerated in triplicate to yield viable bioaerosol concentration at each sampling point and time. Chamber control trial data was subtracted from Novaerus trial data to yield net log reduction in the chamber for each bioaerosol challenge. At 30 minutes, the NV 1050 system showed a net LOG reduction for A. niger spores of 3.85 LOG for Trial 1 and 4.35 LOG for Trial 2. The average 30-minute net LOG reduction was 4.10 LOG. The net LOG reduction at 60 minutes showed a 4.28 LOG reduction for both trials due to reaching detection limit, actual LOG reduction is theoretically much higher at 60 minutes in a small room environment.